The Arizona Corporation Commission , (ACC) is the part of state government which regulates most utility companies in Arizona (but not Salt River Project) and sets rules for solar as well as all other aspects of utility operation. Unlike most other states, the ACC members are elected for four year terms. The ACC has established requirements for regulated utilities to meet regarding solar (15% of their electricity from renewable sources by 2025) and energy efficiency (22% by 2020). The ACC meets each month for "Open Meetings" where the commissioners vote on staff proposals which have been generated in response to a request from a utility company. You can participate in these Open Meetings by reviewing the agendas, testifying by telephone or in person, or by watching the meeting live on streaming video or later on the Internet. The ACC website has links to each case it hears, as well as agendas, Opening Meeting dates, etc. Here are dates and times for upcoming ACC Open Meetings and Workshops. RUCO (the Residential Utility Consumer Office) is a state office which represents the interests of residential utility customers in cases before the ACC by presenting testimony and argument. 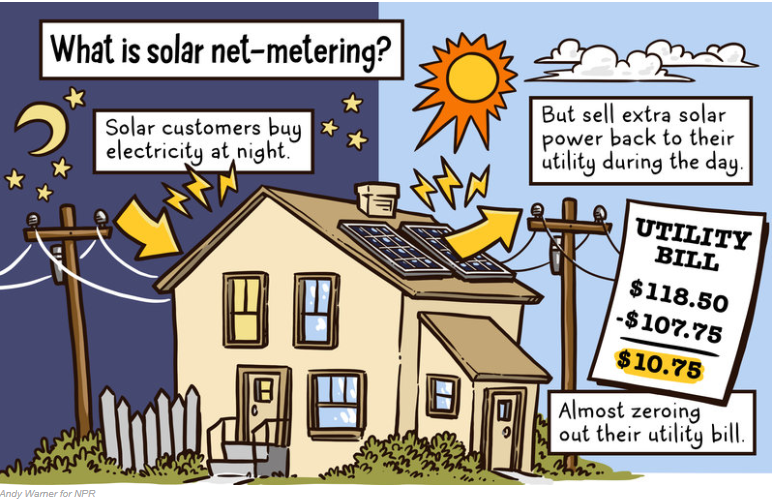 RUCO has posted a useful Consumer Guide for people considering solar. Customers with solar electricity (PV) panels first use the electricity they generate to meet their own power needs. Under present Arizona Corporation Commission (ACC) rules, when customers send excess power to the grid, they receive full kWh credit on future bills and can roll over this excess from month to month. In October of each year, Tucson Electric Power (TEP) pays customers at wholesale rates (roughly $.03/kWh) for any power sent to the utility and not used during the year. In 2014 and 2015, TEP and Trico (along with Salt River Project and Arizona Public Service and several Arizona electric co-ops) have sought to change the rules so that the excess power is valued at much lower rates rather than full retail rate credit. In addition, the utility companies have proposed additional fees and charges that would make solar more expensive. The ACC will decide these issues in 2016.